"Apple has become one of the top five US computer makers by market share, outperforming industry growth by a factor of four. "It appears Apple is running up the inside lane. IDC reports it's the fifth place PC player in the US, with 737,000 units shipped. Apple's market share there climbed from 3.3 per cent to 4.3 per cent for an astonishing 44.6 per cent year-on-year growth. "Gartner is even more optimistic, reporting that Apple is now the fourth place PC maker with 744,000 units shipped for 4.2 per cent of the market." PR: Apple has unveiled its new Power Mac G5 desktop line featuring the Power Mac G5 Quad, providing quad-core processing with two 2.5 GHz dual-core PowerPC G5 processors. All Power Mac G5 models now feature dual-core processors, a new PCI Express architecture and higher performance graphics options including Nvidia's Quadro FX 4500, bringing the industry standard for workstation graphics to the Mac. 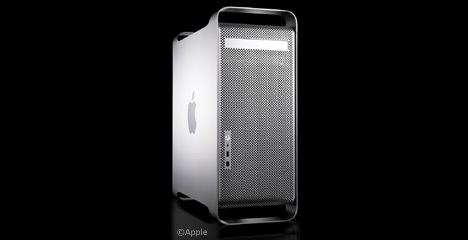 "The Power Mac G5 Quad delivers the workstation performance our creative and scientific customers demand," said Philip Schiller, Apple's senior vice president of Worldwide Product Marketing. "With quad-core processing, a new PCI Express architecture, and the fastest workstation card from Nvidia, the new Power Mac G5 Quad is the most powerful system we've ever made." The scientific benchmark Bioinformatics Benchmark System (BBS version 3) completes a comparison of genomic sequences up to 39% faster on the Power Mac G5 Quad when compared with the Dual Processor 2.7 GHz Power Mac G5. The Power Mac G5 line offers leading-edge expansion with industry standard PCI Express architecture, providing four expansion slots to support high-performance video and audio devices and multiple standard graphics cards to drive an array of up to eight displays. The Power Mac G5 delivers up to 16 GB of 533 MHz DDR2 SDRAM and now features two Gigabit Ethernet ports - ideal for customers working in an Xsan® environment. Providing industry-leading connectivity and high-performance I/O, every Power Mac G5 also includes one FireWire 800 port, two FireWire 400 ports, four USB 2.0 ports, two USB 1.1 ports, optical and digital audio input and output, and built-in support for AirPort Extreme and Bluetooth 2.0+EDR. The new Power Mac G5 line also includes Apple's next generation mouse, Mighty Mouse, featuring up to four programmable buttons and an ingenious Scroll Ball that lets users scroll in any direction - vertically, horizontally and even diagonally. The new Power Mac G5 comes standard with either the Nvidia GeForce 6600 LE with 128 MB of video memory or the Nvidia GeForce 6660 with 256 MB of video memory, both provide support for dual-displays and Apple's breakthrough 30" Cinema HD Display, now priced at $2,499. The Nvidia GeForce 7800 GT with 256 MB of video memory and the Nvidia Quadro FX 4500 with 512 MB of video memory are both available as build-to-order options. The Quadro FX 4500 is ideal for demanding animation, special effects and scientific visualization applications such as Alias' Maya and DeLano Research's PyMol. The Quadro FX 4500 can drive up to two 30" Apple Cinema HD Displays and includes a stereo 3D port to connect goggles for stereo-in-a-window applications. The 2.0 GHz and 2.3 GHz Power Mac G5 Dual are available now and the 2.5 GHz Power Mac G5 Quad will be available in early November through the Apple Store, Apple's retail stores and Apple Authorized Resellers. Build-to-order options include up to 16 GB of NECC or ECC DDR2 SDRAM, up to two 500 GB Serial ATA hard drives running at 7200 rpm, Nvidia GeForce 7800 GT with 256 MB of GDDR3 SDRAM, Nvidia Quadro FX 4500 graphics card with 512 MB of GDDR3 SDRAM, AirPort Extreme and Bluetooth module, Apple Wireless Keyboard and Apple Wireless Mouse, Xserve RAID and Apple Fibre Channel PCI Express Card. "The iMac G5 (iSight) computer, while similar in form to previous iMac G5 models, is not compatible with the iMac G5 VESA Mount Adapter Kit (part number M9755G/A). "Apple will not be offering this kit for installation on the iMac G5 (iSight) computer." PR: iMic was the original USB audio adapter that enabled Mac and PC users to add stereo input and output to their USB computers that, otherwise, lacked the necessary hardware support. 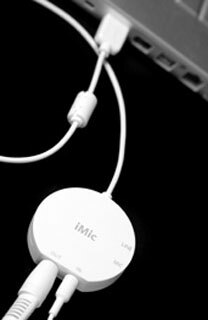 iMic allows you to connect virtually any microphone or sound input device to your iBook, PowerBook, PowerMac or other Mac or PC systems with a USB port. iMic supports both mic and line level inputs via a selectable switch, as well as a variable level output for connecting speakers or headphones. iMic's audio is superior to most computers' built-in audio because it uses USB for the audio signal. USB isolates the audio signal from the noisy electronics in your computer, giving you higher quality sound when you record, and higher quality sound output for external speakers. iMic shines as the essential tool for converting your old LPs and tapes into MP3s and CDs. Griffin's audio recording software Final Vinyl for Mac OS X (provided for free exclusively to iMic owners) makes recording old records and tapes super easy, with several advanced features such as waveform-based cue editing and built-in 10-band EQ. Final Vinyl can also equalize LPs without having to connect a turntable to a pre-amp. Just hook the turntable directly to the iMic, and Final Vinyl will record your LPs perfectly. Griffin also produces a wide range of cables and a mic to get you hooked up. PR: Citing new lower shipping and CPU costs Daystar Technology, an Apple Authorized Reseller and Mac Solutions Integrator, announced today, that it is cutting the iMac Flat Panel Upgrade pricing. The upgrades utilize the most powerful G4 CPUs available today. In additional to nearly double the CPU cycles, the upgrades also double the high-performance L2 cache size from 256 KB to 512 KB. The net result... more than 2x real-world performance for all iMac Flat Panel owners. Better shipping and CPU costs, become lower user prices. Daystar has moved it's shipping exclusively to FedEx, which has generated lower pricing on shipping. New distribution agreements have also lowered the costs of the "upper-end" Freescale CPUs used for their iMac upgrades. Daystar is passing the savings onto the customers. The result being lower prices, all around. "We are amazed at the number of orders! ", said Gary Dailey, president of Daystar. "The rate of acceptance has allowed us deliver even lower pricing, and drop below the $500 price barrier." 3-way shipping options, for maximum flexibility. Features include: Xbench 1.2 Scores jump from the mid teens to the high 50's, surpassing the fastest iMac G4, and some iMac G5s. Double performance for all OS operations and applications. Highest qualified G4 CPUs available, rated to 105c! Factory installation via Apple Certified Technicians. Daystar 21 point system test and diagnostics, with overnight burn-in tests. Effortless shipping with Daystar's custom box and prepaid shipping options. Compatible with any Mac OS since 9.2... Including Tiger 10.4.x. Supports dual boot systems - works with everything you own. Includes XLR8 MAChSpeed Control for exclusive G4 performance / compatibility. All upgrades warranted at speed sold, with Daystar's exclusive 90/728 warranty program. Also include 30 Days of Daystar's New ProTech support. PR: US Modular introduces the latest Dragon Drive - 120 GB of storage in a ultra-slim, stainless steel package the size of your back pocket. US Modular, a leading designer and manufacturer of personal memory and storage products, has announced that the company's award-winning Dragon Drive now comes with more firepower, a huge 120-gigabyte of storage space. The new 120-gigabyte drive has won the coveted Editor's Choice award in several magazines and is on the market for $399. The BUS-powered portable external storage drive system is offered in massive sizes of 20 GB to 100 GB and comes in a stainless steel package. Dragon Drives are some of the tiniest portable auto-detectable combo (USB 2.0 + FireWire) hard drives (2.5" form factor) on the market today. Less than an inch high, these ultra-slim high-performance hard drives are the ideal storage solution for palmtops, notebooks or desktop PCs - at home, in the office or anywhere in between. Unique in that they require no messy AC power cords (they are 100-percent powered through the two included USB 2.0 cables or FireWire cable), the Dragon Drives maintain a sleek footprint making them the perfect laptop or desktop companion. With both Hi-Speed USB 2.0 and FireWire connections, setup is a snap and data transfer is blazing fast. 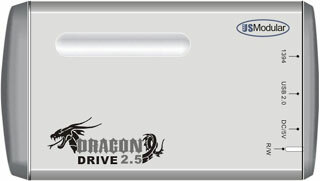 Dragon Drives are available in size configurations of 20 GB to 120 GB and will be priced at MSRPs of $99 to $399. SALES: 120-gigabyte Dragon Drives will begin shipping in October and will be available nationwide. Vendors interested in carrying US Modular's award-winning lineup of products may contact US Modular directly at sales@usmodular.com. Based on customer feedback and innovative new technologies, Maxtor Corporation today announced its new Maxtor OneTouch III, Turbo Edition external storage solution that takes the complexities out of RAID and delivers a simple-to-use, easy-to-understand solution for the consumer mass market. With capacities up to one terabyte (1 TB or 1,000 GB), the new Maxtor OneTouch III, Turbo Edition integrates Maxtor's award-winning automated backup and restore capabilities for Mac and PC users, allows users to easily configure the solution for either RAID 0 or RAID 1 and includes new software tools to synchronize data between two or more computers and to help repair PC systems after a damaging spyware or virus attack. Building on Maxtor's years of success as a leader in external storage, the Maxtor OneTouch III, Turbo Edition also sports a completely new customer experience, including a cool new industrial design, an improved software user interface and redesigned retail package from award-winning consulting firm frog design inc. The solution's new industrial design provides added reliability and robustness, while being soft to the touch and easily stackable. The improved user-friendly interface creates a level of consistency and ease of use, and the redesigned retail packaging system protects the product during transit. Built to last, the new high-capacity, dual-drive Maxtor OneTouch III, Turbo Edition solution is aesthetically appealing for either a home or office setting. It features improved acoustics, a self-adjusting cooling system and an inner disk drive casing and shock mounts for additional drive protection, underscoring Maxtor's commitment to providing durable and innovative storage solutions. "As a leader in consumer storage and backup solutions, our job is to help protect our customers' digital lives. We're thinking about the difficult things so our consumers don't have to. We want data backup and protection to be virtually effortless," said Stacey Lund, vice president of marketing, Maxtor Branded Products Group. "We've designed our new Maxtor OneTouch III, Turbo Edition to be the easiest, most trustworthy way to reap the benefits of RAID, and to back up and store photos, videos, games, music, business data and personal information in the most demanding environments. Whether you're a consumer, creative professional, mobile warrior or small business owner, you can use our trusted, intuitive storage solutions in safeguarding your digital life or life's work." The new Maxtor OneTouch III, Turbo Edition is ideal for more advanced users and creative professionals, such as videographers, photographers, and graphic artists who need high performance and high capacity. It's the industry's first two-drive solution that is user configurable as either RAID 0 or RAID 1. Until very recently, a redundant array of independent disks (RAID) - which can increase data safety, performance or both - was only found on very expensive servers. But now even mainstream computer users can easily take advantage of these benefits by using the new Maxtor OneTouch III, Turbo Edition in a RAID 0 or RAID 1 configuration. RAID 0 divides a data stream and writes pieces of it to both drives at once, a process called striping. This process enables significantly faster write and read times for speed-hungry applications like video editing and game loading. RAID 1, also called mirroring, simply takes everything that gets written to the primary hard drive and creates a copy of it on the second drive. That way, if calamity hits the first drive, the second one swings into action so the user does not experience data loss or downtime. Maxtor has also added Sync - a feature with the ability to automatically synchronize files between two or more systems on the same operating platform - to its newest external storage solution. Increasingly, customers want to share data easily and automatically between home and office, syncing files and folders in both computers. Also, to combat spyware, adware and viruses that can slow a system to a crawl or even a screeching halt, the new Maxtor OneTouch III, Turbo Edition includes a System Rollback feature that reverts a PC system to a healthier point in time while preserving current data. 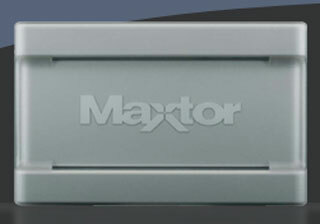 All of these features are easily accessed through Maxtor's completely redesigned graphical user interface. All Maxtor OneTouch external storage and backup solutions come with a data security feature called Maxtor DriveLock, providing a password protection option to safeguard contents if the drive is ever lost or stolen. If the Maxtor OneTouch solution falls into the wrong hands, special firmware embedded on the hard drive restricts data access. Even if the internal hard drive is removed from the casing and attached to another computer, access will be denied without the correct password. The Maxtor OneTouch III, Turbo Edition comes in a 600 GB or 1 TB capacity and features a triple USB 2.0/FireWire 400/FireWire 800 interface for easy connection to a Mac or PC. Availability begins in December at major U.S. retailers, distributors and online stores, as well as from Maxtor. The manufacturer's suggested retail price for the 600 GB is $549.95 and $899.95 for the 1 TB. Worldwide availability varies by region.